As a consumer I am like everyone else, I do not like prices going up. As a practitioner I appreciate well executed price increases. Starbucks and Apple continue to be shining examples of well executed price increases. Starbucks scores big for its repeated success and Apple for the high profit impact of its methods. While not quite in their league, I want to call out AT&T for its recent price increase rollout. 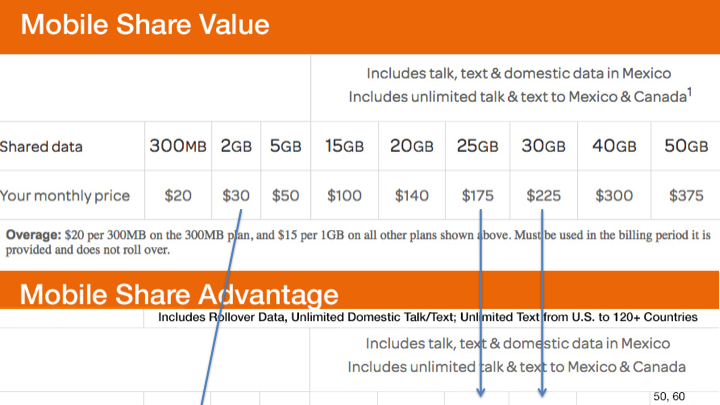 Here is the before and after wireless pricing plan. If you look closer you will notice the finer points of this well executed price increase. Branding: The branded the entire spectrum of options differently, from Mobile Share Value to Mobile Share Advantage. The latter supposedly convey better value than just the word ‘value’. Eliminate the lowest priced option: In most cases, from a car wash to mobile service plan, you can execute a successful price increase simply by eliminating the lowest priced option. The reason is that it tempts too many people to self select. Increase price on lower end: Will the customers not complain or switch? Some likely would but AT&T incurs higher cost to support these low value customers and there really is no where else these customers could go glen similar low end strategy from other providers. Manage reference price effect: Reference price is what the customer is used to paying for and expects to pay in future. Customers are sensitive to that and react to that. One way to manage reference price effect is to avoid apples to apples comparison, remove old versions and replace them with newer different versions. In this case you can see except for two data levels most levels are new. Give more of what costs you less and what customers value more: Wireless service is a fixed cost business. After the infrastructure is laid out there is no additional marginal cost to serve you 3GB or 20GB. So AT&T packed more GB on higher end and lowered the price points. This will nudge more to move from lower band to higher price points compensating for any lost revenue from lower prices at this end. In any case they have enough data to show number of customers in each price band and how much data they use. That is not bad for a backend infrastructure company.